Original painting in possession of maker. Born in Benson, Minnesota, Mark Kennedy is the 12th President of UND. He received a B.S. degree at St. John’s University in Minnesota and an MBA at the University of Michigan Ross School of Business. Serving in the U.S. House of Representatives from 2001-2007, Kennedy then served on the Advisory Committee on Trade Policy and Negotiations under both Presidents George W. Bush and Barack Obama. Prior to coming to UND, he was also Director of the Graduate School of Political Management at George Washington University in Washington, DC. 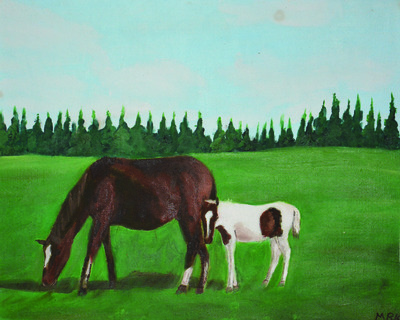 Kennedy’s painting was a youthful exercise. Perhaps more art will follow.